Sitting on a rocky outcrop above the town of Imlil near the foot of the tallest peak in North Africa, this unique hotel is just 45 minutes from Marrakech, yet feels worlds away. Surrounded by the Toubkal National Park, the beautiful gardens and large terraces offer unparalleled views of the surrounding mountains. 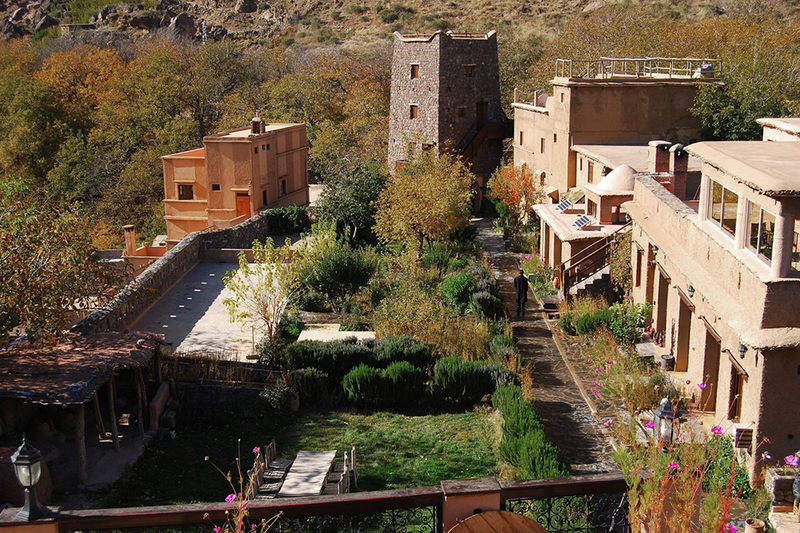 For trekkers and walkers, the hotel also has a remote trekking lodge on the outskirts of Aït Aïssa, a traditional Berber village in a neighbouring valley. It truly is the ideal place to experience the Atlas Mountains, for both the experienced trekkers to the nature enthusiasts, to those simply wanting to experience Berber culture and lounge on the carpeted terraces sipping Moroccan mint tea. There are fourteen comfortable en-suite rooms, three of which can be used as a private self-contained house. In addition, there are three family rooms. The garden apartment, the Ifri suite, has its own lounge, terrace and balcony. The garden house has a 12-metre glass wall and a balcony looking up to the waterfalls and High Atlas mountains. All other accommodation is comfortable, but more basic. 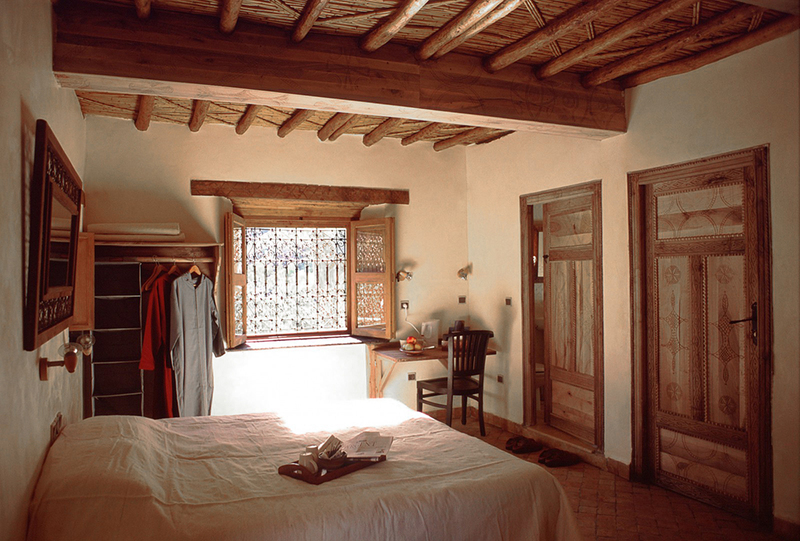 As a member of the National Geographic Unique Lodges of the World, the Kasbah is one of 22 unique lodges in the world that were chosen based on respect of the local cultures, the ecosystem and the unique experience offered for guests while supporting the local communities and embracing sustainable practices. The hotel restaurant has very simple, but good Moroccan cuisine with set lunches for 15 euros and 20 euros for dinner. Kasbah Bab Ouirka is a 45 minute drive to Marrakech and the International Menara Airport. Fly there from the UK and other cities in Europe with British Airways (www.ba.com), Royal Air Maroc (www.royalairmaroc.com), EasyJet (www.easyjet.com) and Ryanair (www.ryanair.com). Airport transfers are available through the hotel, or hire a private taxi/"taxi collective". Rooms start at $180 (standard suite) through to $460 (apartment suite), plus tax and 5% local community benefit tax, and includes breakfast. Berber tradition dictates that no alcohol is served on the premises. You can bring your own with you so long as you’re happy to serve yourselves. The hotel’s remote reception is in the town of Imlil. It is staffed between 9am and 5pm, but out of hours you’ll need to call to arrange for someone to meet you. It's a 15-minute walk up the hill (but your luggage will be carried by a trusty mule). All bills incur a five per cent charge that benefits Village Association community projects. Surrounded by Toubkal National Park, there is endless hiking and trekking and excursions offered, including guided ascent of Jbel Toubkal, the highest peak in North Africa (4167m). The Toubkal Lodge allows guests of the Kasbah to stay overnight up the mountain. A chain of lodges, all built in the architectural style of the surrounding villages, the first being in the village of Id-Issa. There is underfloor heating, three en-suite rooms, and incredible views from the terrace and the lounge, equipped with a wood-burning stove and music facilities. In addition to just trekkin gin and out, you can also arrange mountain biking excursions. You can book the whole lodge for €550 a night half board, or €200 per room. A full day's trekking to get there or back again, including a Berber team with a registered guide, and cook/muleteer to make your picnic lunch, is €70 a person. A 4x4 transfer costs €120 for up to six people.